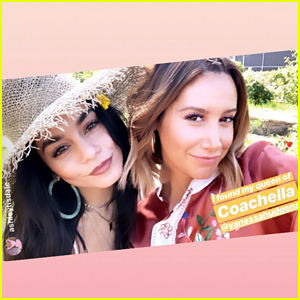 Vanessa Hudgens is back in her prime at weekend two of the Coachella Music Festival! The 28-year-old singer/actress has been taking to Instagram for the past few days to share her adventures in the desert as she enjoys the second weekend of the music festival. While attending Coachella on Saturday, Vanessa went flower-child pretty in a white, lace dress while wearing a sunhat with her name on it. On Sunday, Vanessa turned into a butterfly as she danced around while wearing a rainbow cape and floral-printed maxi-dress. FYI: Vanessa is wearing a Hat Attack hat in the main photo. She is wearing a Camilla dress with her wings.